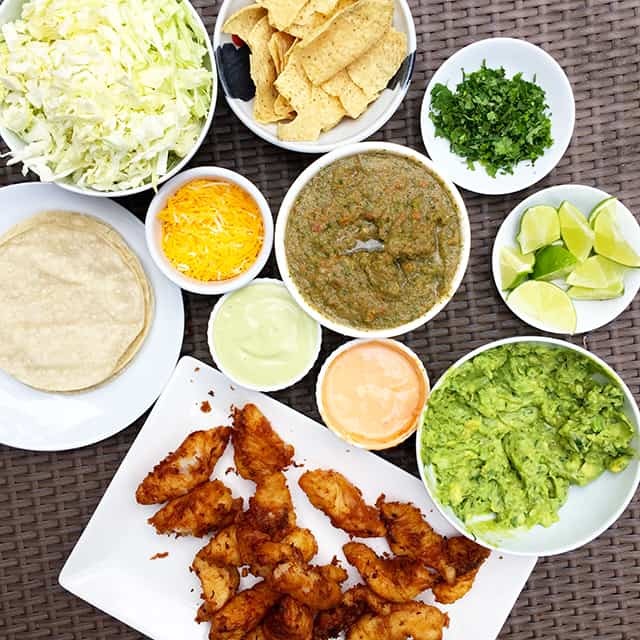 I am excited to share this Beer Battered Fish Tacos recipe in time for you to try out for my favorite day, Taco Tuesday. 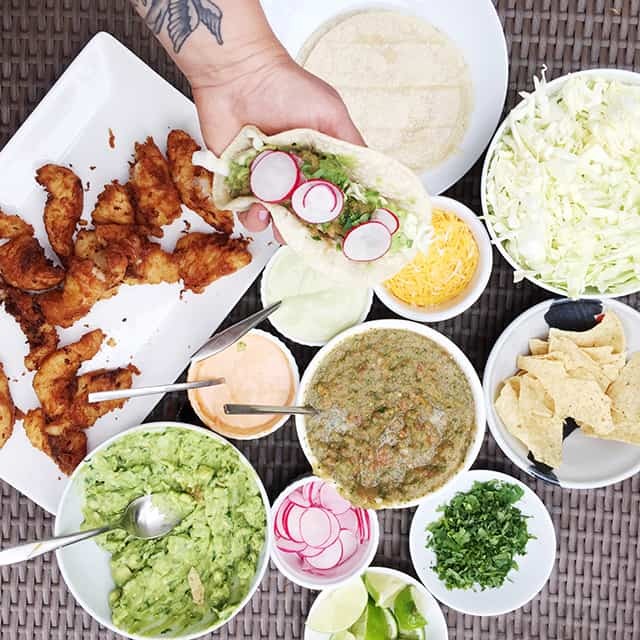 I am excited that these Tacos were featured on http://www.thefeedfeed.com/mexican (scroll down to my tacos feature). It’s best to make the batter a few hours before you actually dip the fish. The resting time will allow the bubbles in the beer to activate the baking powder and flour, making for a crispier, fluffier crust when the fish fries. In a large bowl whisk together the flour, baking powder, and beer until a smooth thin batter forms. If the batter is too thick add a bit more beer (or water or club soda) to thin it out. If the batter is too thin add a bit more flour to thicken it. It should be thinner than a pancake batter but slightly thicker than a crepe batter. Loosely cover with plastic wrap and let stand at room temperature for at least 30 minutes but 2 hours would be better. Cut the cod fillets into (2-3 inch pieces) strips. Pat the fish with a paper towel to make sure it is completely dry. Season both sides with some of the salt. Reserve half of the seasonings for later on. In a shallow dish, pour the 1 cup of all-purpose flour and the reserved salt, Mexican seasoning, whisk or stir to combine. That is your flour dredging. We do this so the beer batter can stick to the fish. In a large pot, or dutch oven, heat oil to 375°. If you fill up the pot halfway with oil, that should be fine. Once the oil is hot, the fish is ready to be fried. Working with one piece at a time, dip the fish into the seasoned flour, coat evenly on both sides. Then dip the fish into the beer batter, completely dunking it until it is fully submerged. Drain excess batter and then carefully drop the battered fish into the oil. Don’t overcrowd the pot, work in batches. Fry for about 4 minutes on the first side. Flip it over and continue to cook for another 2 to 3 minutes on the second side. Only flip the fish once. Remove from the oil and drain on paper towels. Transfer to a cooling rack placed on top of a baking sheet. Repeat with remaining fish. To keep the fried fish warm and crispy until ready to eat, place the baking sheet in a 200°F oven. Garnish to your preference and enjoy! MIx all ingredients in a bowl with a whisk. Put all ingredients into a food processor and blend well. If you find your batter to be too thick add a splash more beer or water to thin it out. If your batter is too thin add a bit of flour to thicken it. It’s really equal parts liquid and flour so you can’t really mess this one up. It’s easily fixable. I used cod for this recipe. I just think that it’s a perfect fish for frying and it doesn’t break the bank either. Try to use fresh fish (if you can find it or have access to it) but if you must and only if you absolutely must, well then go ahead and use frozen.